Pancee, 12 Week Online PT Programme. 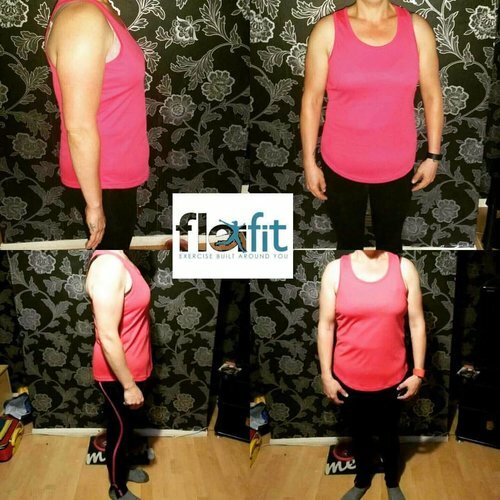 Having lost a lot of confidence through various injuries, I joined Flexifit a few months back to regain my strength & confidence -now I try to attended every bootcamp & insanity session! The classes are varied & there is always such a nice atmosphere within the group! Sam & Ally really know their stuff, they constantly support & motivate you to meet your goals & they are one of the nicest couples you'd ever wish to meet! I 100% recommend Flexifit to anyone! My current level of fitness and loss of weight, I had not thought possible a few years ago particularly in my job where I sit behind a desk for most of the day. Sam has set me on the road to lead a much healthier and more balanced lifestyle which had been proving very difficult before I met Sam. He always adapts and changes what we did to keep sessions interesting and each is different from the previous one. I always would look forward to our next session. His patience, skill and level of understanding enables him to push me right to the edge, always driving my fitness to the next level. He is always full of encouragement and has a pleasant manner that always seems to get the best results out of me. Wendy, 6 Week Personal Nutrition Challenge. In Better shape post partum thanks to Sam's flexi mums class. Great at targeting key areas I wasn't happy about before and a great feeling getting into my pre pregnancy skinny jeans! Sam's motivational and goes above and beyond. Have also thoroughly enjoyed his Bootcamp with Wife Ally! Amanda, Gold Nutrition Package plus 1 weekly PT session. I've been going to the bootcamp and insanity classes for over a month now, and have achieved great results. These guys will always push you hard and motivate you to push yourself, if your struggling, they will adapt the exercises to you and always be happy to jump in the session when they need to! Highly recommended. Especially when there is a cake at the end of the class occasionally! Mel, 6 weeks into her 10 week Transformation Challenge (PT and Nutrition support).